The Council of Large Public Housing Authorities (CLPHA) is a national non-profit organization that works to preserve and improve public and affordable housing through advocacy, research, policy analysis and public education. Our membership of more than seventy large public housing authorities (“PHAs”) own and manage nearly half of the nation’s public housing program, administer more than a quarter of the Housing Choice Voucher program, and operate a wide array of other housing programs. The San Antonio Housing Authority (SAHA) will build a neighborhood park on San Antonio's East Side with funding from its $30 million Choice Neighborhoods Initiative grant. Participants of HASLC's pilot program interview for construction jobs. 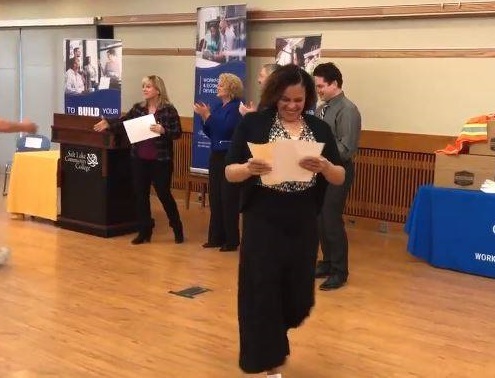 The Housing Authority of Salt Lake City (HASLC), one of CLPHA’s newest members, is demonstrating how building partnerships to connect housing, workforce, education, and transportation systems can improve lives in their community and offer pathways to stable employment and affordable housing. Through an innovative pilot program, HASLC and their partners are providing individuals who had previously experienced homelessness with free, temporary housing and job training in the construction industry. Thanks to a collaboration between HASLC, Salt Lake City’s Department of Development (SLCDD), the Utah Department of Workforce Services (DWS), Catholic Community Services of Utah, Salt Lake Community College (SLCC), and the Utah Transit Authority (UTA), nine individuals have graduated from the program with certificates of completion, tool sets for their jobs, and new careers in the construction industry. The pilot involved HASLC offering twelve homeless individuals up to six months of free housing while the participants attended a month-long intensive training program in construction framing at SLCC. Participants were further supported by partners providing food and necessary household items, education in the “soft skills” needed for sustained work in the construction industry, and transportation assistance to and from the framing course from UTA. After graduating from the program, students were guaranteed interviews with several local construction companies, and as of publication, all nine graduates of the program have been hired in the construction industry. HASLC will continue to offer the graduates free housing for the remaining five months of the program while 25% of their new income is saved in an escrow account to help them fund future, permanent housing. Case managers with Utah’s DWS will also continue to provide support to the graduates. HASLC Deputy Director Britnee Dabb expressed that the program’s success and graduation rate far exceeded their initial expectations. HASLC was impressed with the dedication of the program’s participants – Dabb noted that the trainees, who ranged widely in age and employment experience, worked well together and “held each other accountable,” making the group’s success a true team effort. A graduate of the pilot program receives her certificate of completion. HASLC, SLCDD, and their partners have received funding from Morgan Stanley and other sources to continue the program, and Nackerman is optimistic that future iterations of the program will be well-funded based on the substantial success of the pilot. HASLC also hopes to evolve and extend the pilot – some ideas for the future of the program include offering training in plastics manufacturing (a big industry in the area), lengthening the program duration, and opening program eligibility to HASLC’s Section 3 residents. HASLC’s pioneering work with local agencies in other fields and disciplines to provide previously-homeless Salt Lakers with free housing as they complete this pilot program is a wonderful example of CLPHA’s premise that housing is a critical foundation for stability in other areas of life, and that collaboration across sectors can be instrumental to low-income individuals attaining employment and self-sufficiency. CLPHA’s commitment to this work is shown through our Housing Is Initiative, which is helping to build a future where systems work together to improve life outcomes. We are proud to have HASLC as a member and to champion their efforts as a promising practice for breaking down silos, aligning systems, and increasing positive long-term outcomes. CLPHA looks forward to hearing about HASLC’s future accomplishments with this innovative program.